Hello, everyone! This is a really great week of reviews I have coming as well as an exciting week for events as I get to see Katherine McGee at Bluewillow Bookshop on Thursday! Also, yesterday, John Green read the first chapter of his new book Turtles All The Way Down. I've loved every book that John Green has ever written and the premise that was so focused on exploring Hazel Holmes and her life with OCD and intense thought spirals made me so hopeful for it because it sounded like a book that needed to be in the world and something that could help people. Well, the summary didn't disappoint. Even just the first chapter made me feel so warm and truly understood that I cannot wait for the rest of the book! I preordered a signed copy on Amazon when the book was first announced, but they have since run out, so if you haven't preordered, I would recommend asking your local indie bookstore about it. Characters: 5 Each of the characters and three dimensional and have that touch of reality. Gem, as the POV character, presents everyone with a clear understanding that no one is only good or only bad, but in an honest way that doesn't seem instituted by the author to try to make well rounded characters. Gem's want to understand things and work them out gives her a grounding and hope that readers cling to. With Dixie, she's always had Gem to be the bigger one and take care of her, but now that she's fourteen, she's started to figure out how to care for herself leveraging things like her looks to get extra food. She wants more independence and choice that Gem has a hard time giving up because she's fended for Dixie so long. Also, Dixie feels a loyalty and a bond to her parents that Gem doesn't which leads her to do things she knows is wrong like getting drugs for their mother or keeping secrets for their father. Finally, the school councilor, Mr. Bergstrom presents an adult who is understanding and willing to help Gem with her troubles. While he is always open and caring, Gem worries about how much to tell him about things like her parents drug problems or the money for fear of getting her parents in trouble. In the end, he is able to actually help Gem beyond counciling her on the issues she tells him about. This provides a more balanced prospective on adults than in many YA books. Plot: 4 The plot was interesting and kept me reading, but it didn't shine for me as much as the other elements. The star of the novel is really Gem's reality and growth and the plot is stepping stones to get her there. Writing: 5 Zarr created an instantly compelling work from the moment I opened the book. 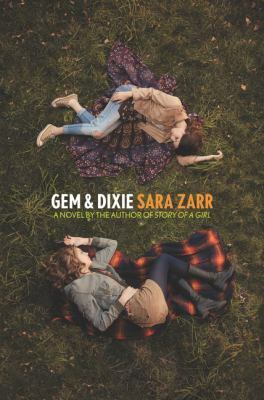 She beautifully painted the picture of the reality of Dixie and Gem's life causing the readers to feel their pain and deeply empathize with the girls and their struggles. She wove the difficult complexities of their world together so that they fit perfectly together and created a vivid picture of what they saw and experienced making the reader forget they are reading.